In an increasingly complex world, the palette of procurement strategies available to oil and gas companies has broadened—complicating analysis of the procurement function, but also offering new opportunities to innovate within procurement and mitigate associated risks. Broader capabilities also change the traditional relationship between suppliers and oil and gas buyers, often requiring greater transparency and information sharing. For many industries, the Procure-to-Pay process is relatively similar in organisations’ back offices; it mainly revolves around managing procurement, purchasing contracts, purchase orders, and invoices. In order to manage these processes as efficiently as possible, some organizations adopt a P2P software solution to achieve automation, control, and savings. For companies in the oil and gas industry however, back-office processes are very different and much more complex than those in other industries, and a one-size-fits-all P2P solution cannot handle these companies’ diverse and nuanced requirements. In oil and gas P2P, companies must consider a variety of unique factors as they handle their operations, suppliers, and business documents. These factors include industry-specific regulations such as environmental guidelines, operational reporting, and supplier qualification. For most companies, processing business documents also entails the widely-used PIDX coding standards that are specifically designed for eCommerce documents in oil and gas. Oil and gas companies also struggle with the standard pains of paper invoices and limited process visibility that come from manual P2P processes. The industry has a complicated P2P process and workflow, often involving high volumes of invoices that are tied to service based contracts rather than purchase orders, and that cover services involving varying quantities and types (e.g., fluctuating output from an oil well on a given day). For these reasons, oil and gas companies must code, validate, and process their invoices at higher rates than in other industries. Even as these companies seek to improve their invoice processing, many struggle to find an automation tool that fits their unique needs. In order to find technology that complies with their special process, these organizations must look beyond the normal scope of P2P automation into the niche, oil and gas-specific software market. This report explores the unique characteristics and challenges of oil and gas companies. It also explores what automation looks like for these companies when they use a niche business solution tailored specifically to their needs and those of their suppliers. Standardization can be very difficult in the oil and gas industry, as there are many different types of operators and suppliers, and each has a unique business process, strategy, and level of technical maturity. In order to maintain some unity in the industry, many organizations follow electronic PIDX standards in their P2P processes. Formed in 1987 by the PIDX (Petroleum Industry Data Exchange) committee, PIDX standards streamline the electronic exchange of data between oil and gas companies by filling in the gaps of electronic B2B communication. For example, the PIDX codes facilitate data exchange for things like well name, well location, field name, or lease name—details not covered in generic B2B coding. These standards mandate that invoices enter the ERP in a consistent format so as to enable smooth processing through the system. They are in place for 14 different business documents used in the Purchase-to-Pay and Order-to-Cash processes, including field tickets, purchase orders, invoices, and payments. The PIDX standards were developed by the industry, for the industry, and have been widely adopted; they are currently used by approximately 120 companies in over 30 countries, and are applicable to all types of oil and gas businesses. When both buyer and suppliers use the PIDX standards in invoicing, B2B interaction is much more streamlined, efficient, and secure. The PIDX committee reports that major oil and gas operators using the PIDX standard for invoicing have seen a huge reduction in invoice cycle times, as well as improvement in process efficiency and management of paper in their Accounts Payable departments. However, when a buying company is dealing with a small or technically outdated supplier that has not implemented the PIDX standards, invoice processing times lengthen and efficiency suffers. In addition to the unique regulatory and process flow challenges for oil and gas companies, companies in this industry also experience P2P pains that are consistent with manual-based processing. A recent survey by PayStream has found that the majority of oil and gas companies have little to no back-office automation, and experience substantial problems in process visibility, invoice approval times, and control over invoices. The below diagram of survey findings breaks the challenges out by problem area. 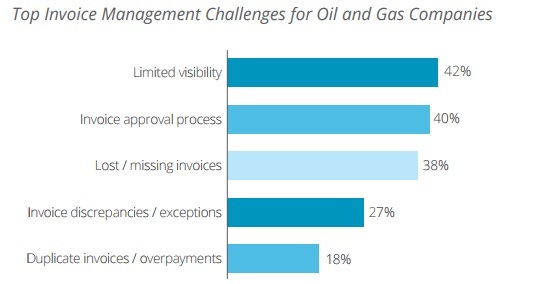 The majority of oil and gas companies struggle with high volumes of paper invoices, many of which are not connected to POs and must be manually checked against service contracts. It is also difficult to maintain compliance with PIDX standards when processing paper invoices; often, the codes are hand-written into the margins of paper invoices. In addition, decentralized operations cause major workflow issues as companies try to route paper invoices between remote locations and accounting teams at administrative branches. Control and data accuracy weaken when using paper-based, manual workflows, causing general delays in processing and payments, and limited visibility into outstanding payables balances. In addition, 76 percent of oil and gas companies are unable to regularly capture early payment discounts. These companies cite lengthy approval times and a high number of invoice errors, including exceptions and missing invoices, as the leading causes for missed discounts. All of these problems are amplified by the industry’s economic challenges. With recent fluctuations in costs for energy resources, many companies have had to rapidly adjust their back-office processes to accommodate the changing demand. Although cost control is increasingly important for the industry, manual methods can be very harmful to an organization struggling to keep afloat, as they lead to high processing costs, late payment fees, and lost early payment discounts. Unfortunately, when oil and gas companies do want to adopt P2P automation to get rid of their process pains, their options are limited. Most P2P software is not suited for their complex needs, and they must be very selective when choosing a system. In addition, because of these companies’ unique business structures and process flows, as well as the industry’s cost pressures, it can be very difficult for an oil and gas company to adopt an automation solution in their back office. These issues cause many companies to carry on with inefficient manual processes rather than face the challenges of transformation. The strides to reduce errors in eCommerce documents is most often being solved, or attempted to be solve with technology, partly because we can invest money in IT rather than upsetting the people who caused the problem in the first place. Its simply not enough to fix problems, unless everyone involved in the eCommerce initiative learns from the collective mistakes we will never get to that golden 100% Tight First Time. We need to Visualize the problem and push such reports out to those involved. 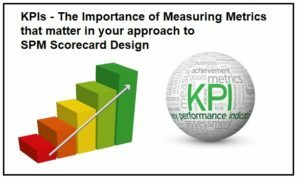 Metrics play an important role on the supply chain, and whether its field ticket processing times, order efficiency, order accuracy, invoices in error %, there is a root cause event or series of events driving the positive and the negative case studies that can be presented by various Operators and Suppliers in relation to eCommerce initiatives. If we provide reporting and visualization tools to those closest to the errors then the likelihood of month on month error reductions will happen. The goal here will be 100% right first time invoices and a smoother and faster turnaround on Orders and Invoices resulting in improved cashflows. 100% right first time would mean that we could significantly improve cashflow, we could reduce risk associated with wrong or late part arrivals. Overall the Operator / Supplier relationship would be a lot healthier. Right First Time Invoices – The role of Visualization in solving ‘the P2P Error problem’ on Field Tickets, Orders, Invoices, and Remittance docs. The Outperform SRM Advisory Team are experienced in design, implementation, and roll out of all sizes of P2P Initiatives and will happily work with your company in order to implement the best best solutions for your organisation.